Companions, growing pains and The Highlanders (1966/7). | Randomwhoness: a Doctor Who blog by Johnny Spandrell. Sampling stories in random order. Companions, growing pains and The Highlanders (1966/7). Three companions is too many, so the accepted line goes. Rubbish, say I. I love a four hand TARDIS crew. Not enough plot to go around? Not if you write it properly. Not enough time for character development? I, and you too I think, know all there is to know about Adric, Tegan and Nyssa. They’d never make that mistake these days? Except for when they had Amy, Rory and River. The Highlanders brings the four strong TARDIS crew back to Doctor Who; since The Chase two years earlier the Doctor had generally got by with two travelling companions. In the show’s early years, three companions were a practical necessity; cameras couldn’t move fast enough between sets to follow one or two characters through a story – you needed lots of familiar faces ready to go on sets in Lime Grove. But the show had clearly got around this and two companions, one male, one female, was working fine. (And indeed would work well again from The Evil of the Daleks to the end of Troughton’s era). So why go back to four regulars now? I want to talk about all four of them, but I think the answer to my question lies in our two young male companions. Let’s start with Jamie (Frazer Hines). The Highlanders is his debut story and the tale goes that he so impressed the production team while they were making it, that they made a last minute decision to add him to the regular cast. I’ve always been a bit suspicious of this story. No doubt it certainly happened, but it’s hard to see what compelling reason there was to add a new companion at this point, particularly a historical one (given the difficulties the previous production team had fitting Trojan escapee Katarina into the series), let alone another young man (given that they already had Michael Craze playing Ben). Compounding my suspicions is that Jamie doesn’t get that much to do in The Highlanders, spending much of the time imprisoned and talking plot details. Spunky highland lass Kirsty (Hannah Gordon) gets a greater slice of the action. So it seems strange that Jamie would stand out as a character so good you couldn’t leave him behind (although of course with hindsight we know that Frazer Hines would go on to be a brilliant companion and an indispensable part of the Troughton era). No, I think it’s more likely that producer Innes Lloyd and script editor Gerry Davis had a problem with Ben. Quite what that was, I don’t know; although the part is occasionally overegged with a few too many forced cockney-isms, Craze always gave a decent performance, as far as I can see/hear. But Lloyd and Davis were ruthlessly unsentimental when it came to the regular cast. They had no sooner joined the series than they dumped long term sidekick Steven (Peter Purves), and two episodes later – mid story! – Dodo (Jackie Lane) became extinct. 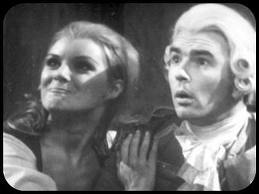 They even managed to prise William Hartnell from the title role two stories before. I don’t think any of the new crew would have felt particularly secure under this regime. In recent years, Polly actress Anneke Wills has revealed that as her and Craze’s contracts were ending, Lloyd approached her to stay on with Troughton and Hines; more proof that Jamie was intended to be Ben’s replacement. In fact it’s surprising Lloyd didn’t simply dispense with Ben as soon as possible; it’s not hard to imagine Ben catching a ship home at the end of The Underwater Menace. But perhaps the complexity of the forthcoming scripts, and the difficulties of replacing a modern day bloke with a 18th century piper meant it was easier to shoehorn Jamie into sci-fi tales like The Moonbase and The Macra Terror than rapidly rewrite scripts nearing production. So it’s ironic that The Highlanders is a pretty good story for Ben. It’s true that like Jamie he spends a lot of it incarcerated, but he gets plenty of good moments, like ripping up Solicitor Grey’s slavery contracts and escaping from Trask’s ship apres dunking. He works well as a plot function – someone to get into trouble, get out of trouble and be a foil for the Doctor – and Craze plays him with a pleasing, terrier-like insistence. But ultimately, the series doesn’t need both Ben and Jamie. But the unique combination a TARDIS crew with two young men at least gives fans the opportunity for some eye opening slash fiction (just Google it, you know you want to. Just don’t blame me for what you find). But neither Ben nor Jamie are the star companion in the The Highlanders; that position is definitely Polly’s. This is a brilliant story for her. Polly could sometimes be a whimperer and is famous for being the one sent to make coffee in Cyberman stories. But here she’s smart (noticing Kirsty’s ring, which becomes one of the story’s McGuffins), resourceful (capturing Ffinch by luring him into a big hole) and crafty (disguising herself as a way to gain information about the whereabouts of the Doctor and Ben… Albeit she disguises herself as a prostitute (this again! See The Next Doctor)). There’s a lovely bit in Episode Four when she’s reunited with the Doctor and Ben and they are planning to liberate the highlanders trapped on Trask’s ship. After Polly’s catalytic role in the story’s first three parts, the usual patriarchy is threatening to reassert itself, with the men planning how they’ll undertake the raid, leaving Polly and Kirsty behind. At this point, Polly flatly refuses to be left out, and the plan is changed. Good for her – she has owned this story, it would have been a crime to sideline her for its conclusion. In fact, aside from The Aztecs and maybe The Crusade, I can’t think of another sixties story which makes as good use of a female companion. And the fourth and most fascinating of our four person crew is Patrick Troughton’s magnificent Doctor, here on his second outing. All Doctors change from their initial conception; some mellow, some blossom. But their early stories always show an interpretation which is very different from where they end up. Think McCoy in Paradise Towers or Smith in The Beast Below. The stories from early in their reign end up as curios, showing us the paths partially explored, but otherwise left untaken. The Highlanders gives us a unique version of the second Doctor, one closer to the character’s original conception than even his debut story. Here the Doctor utterly refuses to answer a question directly, he never shares his plans and his constantly adopting new identities, putting on accents and dressing up. He acts entirely unpredictably; at one point he goes asleep in the middle of the story, much to Polly’s exasperation. And he’s violent; even though it’s a comic turn he repeatedly bangs Perkins’ head against a table in Episode 2 and the story’s problem is solved when he supplies a wheelbarrow load of weapons to the trapped highlanders. But ultimately, a quixotic Doctor, not sharing any of his plans, acting seemingly randomly, doesn’t fit the show’s format which needs the Doctor to be a hero. In the very next story, we’ll see him reverting to type; being much less of an enigma than he is here and acting in a much more Doctorly way. And that’s the way it’ll stay all the way to The War Games. So that’s one of the joys of The Highlanders, savouring Troughton’s tricky performance, knowing it’ll never be quite the same again. LINKS to The Doctor, the Widow and the Wardrobe: in both, the Doctor expresses his love of hats. And because Amy features briefly in TDTWATW, they both feature Scots. NEXT TIME: Damnable business! We travel to that region in space known to the ancients as the Arc of Infinity.